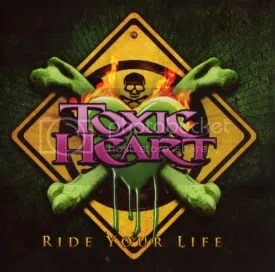 From the name of the band and their awesome logo, you may think this is yet another sleaze/glam metal act from Sweden, but Toxic Heart are actually melodic hard rock act (with a dash of glam) from Slovenia. Ride Your Life is big on hooks, melody and choruses. The whole album has a very positive and uplifting sound. The album makes you feel good while listening to it and that’s about the best praise you can give to any music, isn’t it? It’s not all AOR though, the band shows their glam side on harder rocking songs like “Big Time”, “Makin’ Me Bad”, “One Night Stand” and “Like The Way I Feel” (which is the album’s best song, IMO). Lead singer Axl sometimes reminds me of Klaus Meine, which is appropriate because songs on this album remind me of some of the more uplifting songs in the Scorpions catalog. Toxic Heart is definitely a promising act. Ride Your Life is a well-produced (and self-financed! ), slick and catchy album well worth seeking out for fans of melodic and glam rock.